Time for leisure and time for dreams are intrinsic to the mountains and holidays. At Le Petit Dru, all this plays a central role in our services. Parents and children are welcomed as special guests, for whom we have created dedicated services and spaces. Never mind what time, the experience will be wonderful. Le Petit Dru has a ski room and offers on-site rental service, through our partnership with Intersport, who have a shop within the hotel. This service, a rare one at the resort of Morzine, is one of the advantages we offer our guests. Le Petit Dru offers pilates/yoga classes on request, both introductory, in a simple, accessible way, and more advanced sessions for the seasoned enthusiast. Between postures and relaxation, our teacher-led classes can be an essential addition before or after your days of outdoor sports. Breathing is an inspiration! On request, Le Petit Dru offers individual on-site massage sessions with Laurence, a practitioner in body techniques and wellness. Sessions with her can include reflexology, Californian massage, fuji massage, traditional shiatsu and more, to help you to relax after a day’s activities or workshop. Antoine, our accredited ski instructor, has another passion: mountain biking. On request, he can take you along paths and trails, alone or in a group. Spend time in our lounge to get together over drinks and have fun together. 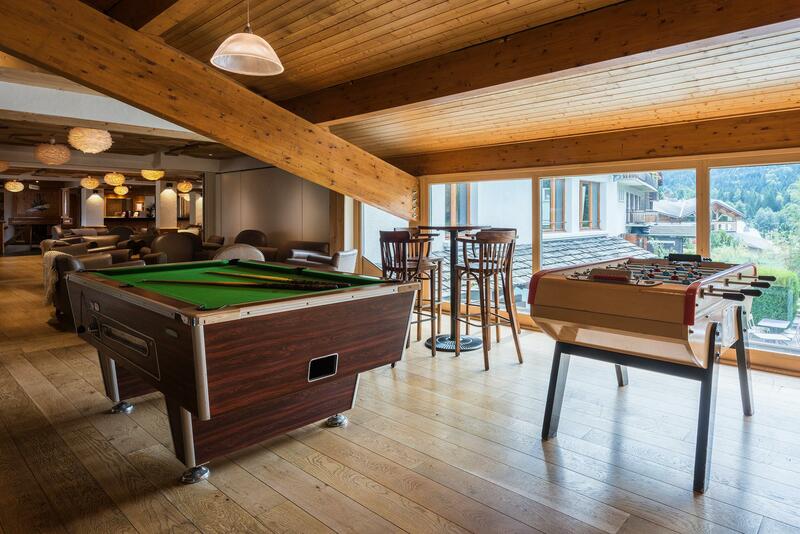 Take time to relax after your outdoor activities, playing carambole billiards, table football or ping pong with friends or family. The Hotel Le Petit Dru has an all-season outdoor heated pool and indoor wellness area with a sauna, jacuzzi and Turkish bath. In waves, bubbles or steam, water in all its forms regenerates the body and mind.